I always find that the summer months have me more inspired to work out than any other time of the year. I know I’m stating the obvious here, but shopping for cute bikinis, having beach days with friends, and wearing shorts and skirts just makes me want to get in my best shape ever. There’s no doubt that staying active is the thing to do this season, and everyone I know is kicking up their workout routine a few notches. But… That’s not to say you have to spend a fortune at a gym or workout studio to exercise. 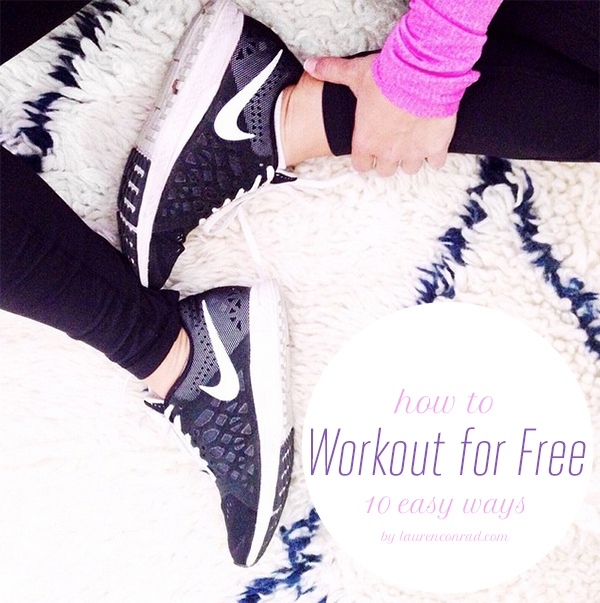 Today, I’ve pulled together 10 awesome ways to work out for free that you can try over the next few months. If you’re a babe on a budget, these ideas will let you pinch your pennies and sweat it out. Whenever I’m trying to save a little more in my bank account, I like to go outside to walk, jog or run instead of paying for a pricey workout class. The best thing about summer is that the weather usually provides for perfect conditions for exercising outdoors. I also think it’s incredible important to take walks throughout the day if you have a sedentary lifestyle or sit at your desk all day at work (like me…guilty). Get those 10,000 steps in and you will sleep better, have better energy, and your clothes will fit better too! 2. Research fun hiking trails around you. Just like running and walking outdoors is a great activity to do during the warmer months, hiking tops the charts as one of my favorite forms of free exercise. Do a quick Google search to find hiking trails that are close to you. You can also modify your search to find trails that are more difficult (look for ones that have inclines and hills to feel the burn), or trails that are easier if you’re getting out there on a weekend morning with a girlfriend. That’s what’s great about hiking—you can find a trail that’s perfect for what you want. 3. YouTube your yoga routine. Nowadays, indoor cycling classes can really take a toll on your savings account. Instead of paying to sit on a stationary bike inside, enjoy the great outdoors by going for a bike ride on a beach boardwalk or outdoor trail by you. If you don’t already own a bike, renting a bike for a day comes at a really affordable price and is a fun activity to do with a friend. 5. Be your own stairmaster. Doing a stairs workout is definitely one exercise that gets me sweating faster than almost any other. And, if I haven’t done stairs in a while, my calves will definitely feel it the next day. You can do a stairs workout by finding stairs in your neighborhood, apartment building, or even using the stairs in your home. Try doing this workout interval style—run up the stairs quickly, then take your time walking down them to catch your breath. Do as many sets as you can for that good old shaky leg feeling. School’s out for summer, which means high school or middle school tracks are usually open and vacant during these months. Find a high school or middle school track by you and run laps, do intervals, or even do stadium stairs. 7. Jump a little rope. If you have a jump rope you can do a jump rope workout in your backyard. Jump ropes come at a really affordable price, so if you don’t have one already, it’s a good idea to make that investment. Then, the rest of your jump rope workouts will be free! Jumping rope really gets your heart rate up and, believe it or not, it’s a full body workout. You will use your arms to turn the rope, abs for stabilization, and legs for the jumping. 8. Swim laps in public pool or ocean. If you’re lucky enough to live by the beach, take advantage of the ocean this summer and use it for your daily exercise. Swimming is a great, low-impact workout, and the salt water in the ocean will leave you feeling refreshed. If you don’t live by the beach, a public pool is a great place to swim laps, too. 9. Improvise your arm workout. When you think about doing an arm workout, you probably picture free weights or machines in a gym… right? Well, you can actually work you’re your arms for free with objects you already have in your house. You can do push-ups, tricep dips on a chair or bench in your house, and even bicep curls + tricep curls with 1.5 liter water bottles. Click here to see more arm workouts. 10. Do a little research. It’s pretty easy to research more free workout videos online. We love the Tone It Up girl’s workout routines, Kayla Itsines’ workout plan, and, of course, our LaurenConrad.com workouts! Find our favorites here, here and here. Do you have any ways to work out for free to add to this list? List them off in the comments below! And be sure to continue sharing your progress on Lauren’s Summer Boot Camp with us by instagramming your photos with the hashtag #LCSummerBootCamp.